1000M is a skyline-changing condo tower that is being developed by Time Equities and JK Equities in Chicago’s South Loop neighborhood. Named for its location at 1000 S. Michigan Avenue, 1000M will stand 74 stories high and hold 323 individual residences once completed, which is schedule for sometime in 2021. For information about 1000M condos for sale or to have updates sent directly to your inbox, contact our new construction condo experts today, or simply fill out the contact form below. Introducing 1000M, Chicago&apos;s most exciting new address! 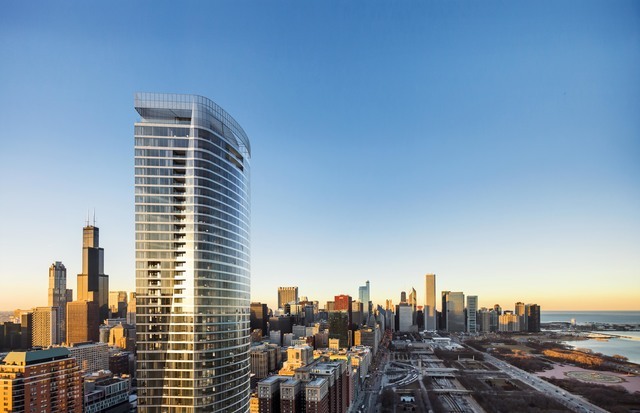 Located directly across from Grant Park, 1000M is designed by world-renowned architect Helmut Jahn and local design icon Kara Mann. Residences range from spacious 1BR to 4BR penthouses, with beautiful design and dramatic Lake and City views. Contemporary high-end finishes, hand-selected by Mann, include; Wolf and Sub-Zero appliances; custom kitchen and bath cabinetry; book-matched stone backsplashes; lavish bath fixtures; hardwood flooring &amp; more. 1000M incomparable array of amenities include an unsurpassed 40,000 square feet of indoor &amp; outdoor space, programmed to delight the mind, body and spirit. Indulge in extraordinary spaces like the Music Conservatory, Library, Spa, Meditation Room, Fitness Center, Outdoor Pool and Gardens. Entertain on the 72nd floor, in Club 1000, with its Demonstration Kitchen, Private Dining Room; Wine Room, Winter Garden and Sky Terrace. Beauty is a journey. And the journey starts at 1000M. Can't find what you're looking for at 1000M CHICAGO? Start browsing other South Loop condos and lofts for sale or give Chicago's Property Shop a call at (312) 243-5200 for help with your condo search today!